As Mikael puts it, Style Over Speed. Hope you're all enjoying the hot weather! why not advocate the use of helmets and save a life ,be brave and say to this woman you are foolish at the least for what your doing . Because it's a personal choice! :-) Not my call at all! wow, do you think the dog knows what those white lines on the road mean? PS I'm with you on helmets being a personal choice, unfortunately here they are compulsory! I'm absolutely amazed that she can respectfully(?) 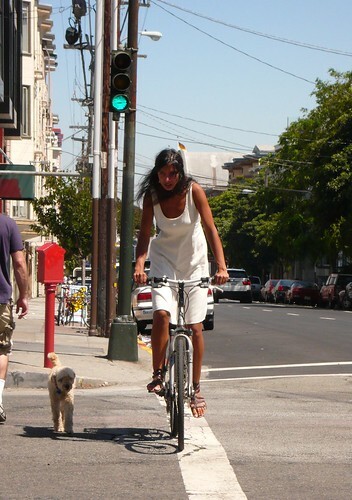 bike while wearing a skirt. I'm a big advocate of bicycle helmets because wearing one save my life. She should, at least, be wearing a white one to match her skirt! [p.s. I always get "skirt" and "dress" mixed up. Skirt's only thigh length, right? I'm amazed that she can cycle respectfully(?) while wearing a skirt! I like to ride respectfully and disrespectfully in skirts and dresses, helmet or no helmet, depending on mood and occasion. And jet - where do you live? I was informed that helmets are mandatory in Vancouver when I was there last week.